Has our dehydrator paid for itself? Probably not yet, but we've only had it around four months. I've made about 6 cups of dried mushrooms, 12 cups of dried summer squash, and 11 cups of dried tomatoes. That doesn't sound like much, until you figure that dried foods take up perhaps a quarter of the space of fresh foods, so the dehydrator has processed around 7 gallons of vegetables already! During peak tomato drying season, I realized that I could slide in some fruit leather for Mark after the dryer had been running for a couple of hours and kill two birds with one stone. Tomato halves are a bit too tall to allow me to put a tray on each shelf of the dehydrator, but they soon shrink down to more moderate dimensions. Then I can add four trays of applesauce to perk up my hard-working husband. We also learned that the delicious (but extremely chewy) black-staining polypore mushroom can be easily broken into tiny pieces after dehydrating. The result is small enough chunks that you don't spend all afternoon chewing, especially if you simmer the dried and powdered polypore for a few hours in a pot of vegetable soup. Of course, the real reason we got the dehydrator was to preserve homegrown fruit. Strawberry season had just ended when we took the plunge, and if we'd had the tool previously, I wouldn't have given away a couple of gallons of berries and lost perhaps another half gallon to improper conditions during one of my rounds of drying in a sunny car. (We still ended up putting away 23 cups of strawberry leather using the car method, so it's hard to complain.) And then our peach tree failed us, so we didn't have any summer fruit to dry. If our strawberries and peaches bear well next year, then the dehydator will pay for itself. Our chicken waterer saves you hours of cleaning filthy waterers. 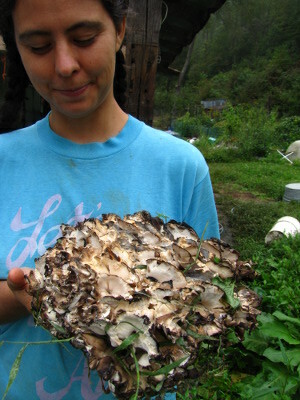 What type of dehydrator did you get? 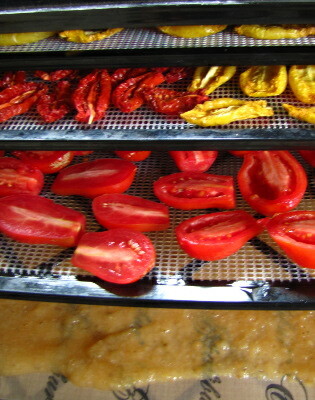 I've been looking at the Excaliber dehydrators, but I can't justify the cost yet. Once we get some fruit trees in place, then I'll be able to do it. You might also be interested in my post about drying food with and without electricity, plus the rest of the lunchtime series linked to from the bottom of that post.